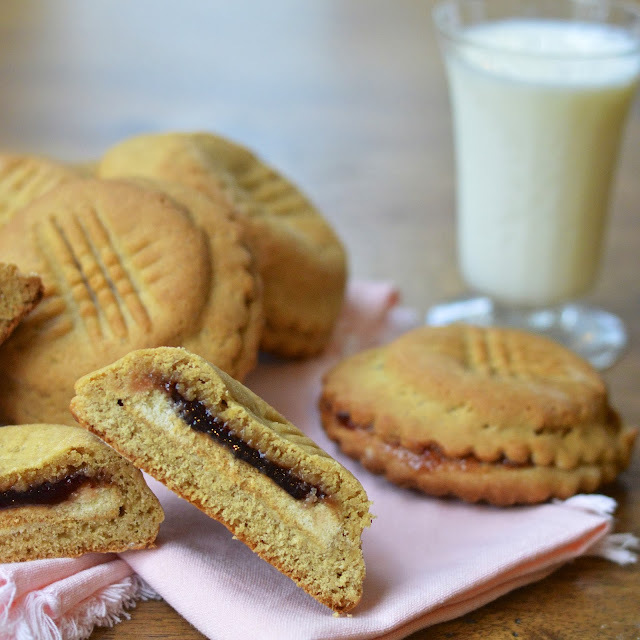 This Double Stuffed Peanut Butter and Jelly Cookie recipe could possibly be the most fun I’ve ever had in the kitchen - ever! I had seen some stuffed cookies on other food blogs but really wanted to come up with one of my own. Perusing the grocery aisle one day, I came across these shortbread strawberry jam cookies. Well, why couldn’t I take this cookie and wrap around some velvety brown peanut butter cookie dough and make a super cookie?! I did it and I’m so glad I did. Just a small warning; one of these stuffed cookies is more like a meal. It’s basically three cookies in one gigantic layered peanut butter and jelly concoction. Also, let’s look at this realistically. You’ve got tons of protein from your peanut butter, carbs and some fruit. So maybe a half sandwich and a cookie for lunch? I think that would be perfectly acceptable. If you have peanut butter and jelly loving kids, they will die over this creation. I advise eating them while slightly warm. The ruby red strawberry preserves will slowly drip into your mouth and the crumbly cookie will simply melt along side. 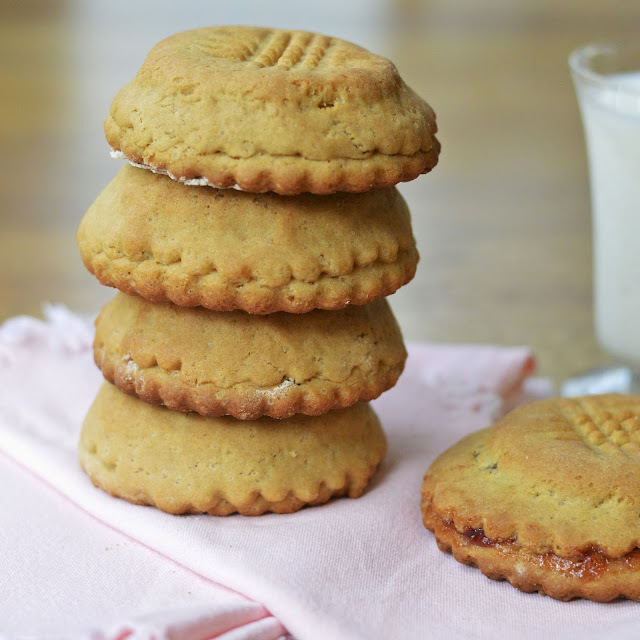 Plus, you have the bonus flavor of vanilla shortbread from the original cookie. I think of this shortbread as the bread to the pb and j. Have some fun and make these cookies or dream up your own stuffed cookie – the possibilities are endless. In a large bowl, cream peanut butter and sugars until light and fluffy, about 3-4 minutes. Beat in eggs milk and vanilla. Combine flour, baking powder, and baking soda; add to creamed mixture and mix well. Form a flattened disk and wrap in plastic wrap and refrigerate for 2 hours or until easy to handle (the dough may seem sticky, but using a liberal amount of flour when rolling works very well). On a floured surface, roll out dough to 1/4" in thickness. Cut with a 3"- 4" circular cookie cutter (I had a fluted 3" biscuit cutter which made a pretty border). Transfer 12 circles to cookie sheets. 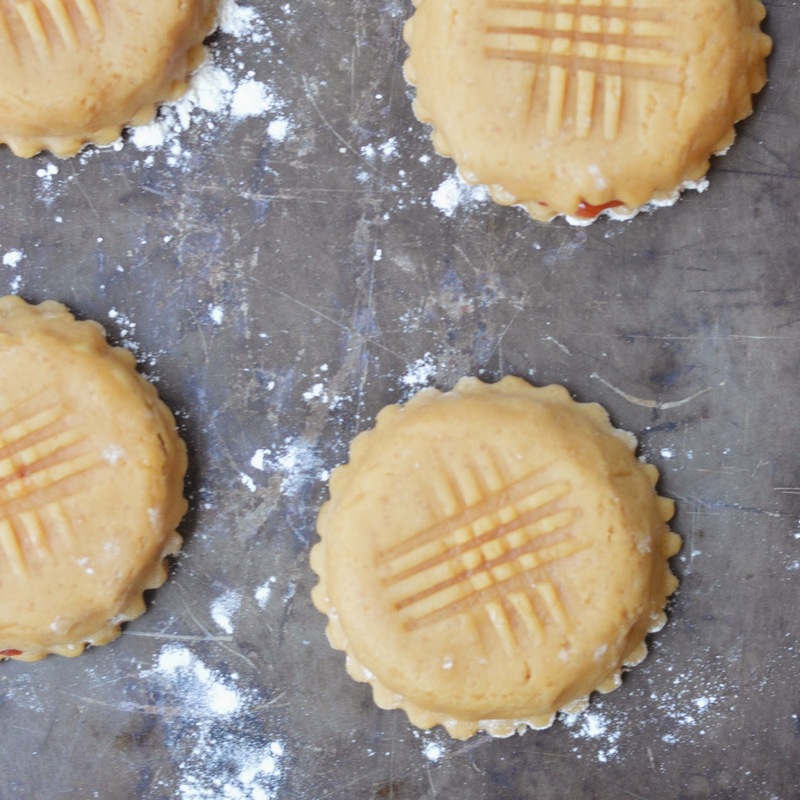 Top each circle with one strawberry shortbread cookie and a teaspoon dollop of strawberry preserves (you can use just the cookie if you want a lighter strawberry flavor). Top with another circle and gently press on the sides to seal. Take a fork and gently press the tongs, flat side down (horizontally) into the cookie. Turn and press down the fork to cross over the existing marks. Bake for 13-15 minutes, or until lightly brown. Cool for a minute on pan and then transfer to wire racks. These look great!! can’t wait to try. Love the jelly in between them.